Try this Tunisian Knit Hat that everyone wants. I don’t crochet, I don’t know how to crochet and to be perfectly honest, I don’t want to learn to crochet. So why in the world do I have this Tunisian Crochet hat on my brand new knitting site? For oh so many reasons. Tunisian Crochet also called Tunisian Knitting is fun, simple, fast and a really nice balance to knitting. The Tunisian woven fabric is nothing like either knit or crochet and is simply stunning with the slow color changes of this Chunky Mochi Yarn. And it’s fast, really fast. I can make this hat in less than 2 hours! It’s a good thing, since everyone that sees one wants one… literally. Coworkers, friends of friends I could knit these full time. In the dark colors, it’s great for guys too. 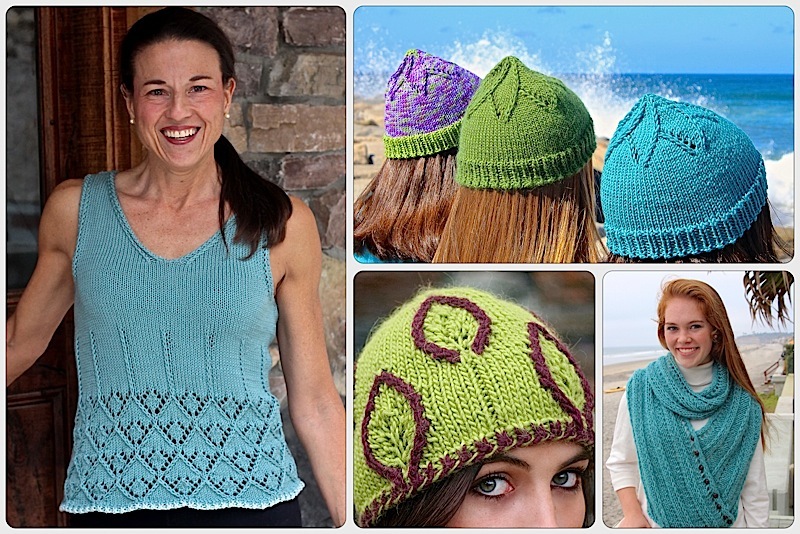 This version uses a bulkier yarn for the brim than called for in the pattern. I took photos along the way and created a photo tutorial on our Photobucket site where you’ll also find more project photos. The pattern also includes instructions for a scarf and blanket as shown below. The pattern is written for knitters who want to try something new. I couldn’t help but think as I wrote this pattern, I was spending an awful lot of time on a pattern you’d only use once. Not that you’d only make one hat, in my experience, you may make more than you can now imagine. But once you’re done with one, you won’t need the pattern again. That’s right, once you get the idea, you’ll see just how easy it is. I love ‘knitting’ these hats. It’s a good thing too, since I’ve made over a dozen. They’re the perfect emergency gift. There have been some problems downloading the pattern on Ravelry so I am also putting a free download on our web site. Very easy beanIe only have one arm so it took me longer than 2hours to make plus I used aran wool and 6mm hook so the largest size fits a youngster.very pleased,, will do more. Thanks. This entry was posted on November 15, 2013 by Laura Cunitz in Free Downloads, Hats, Patterns and tagged free knitting patterns, knit hat pattern, knitting, knitting blog, Tunisian Crochet.